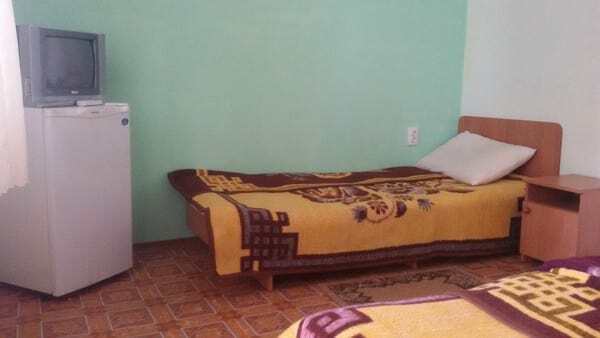 Mini hotel "Almaz" is located in the village. Zaozernoye (Peschanka region) on the western shore of the steppe Crimea, 12 km from the center of Evpatoria and a 10-minute walk to the sandy beach with a gentle descent, smoothly flowing into the Black Sea. This region is famous for its ecologically clean salt water, healing mud, located around and on the territory of the lake region, as well as therapeutic steppe air due to the huge variety of rare and useful steppe grasses. 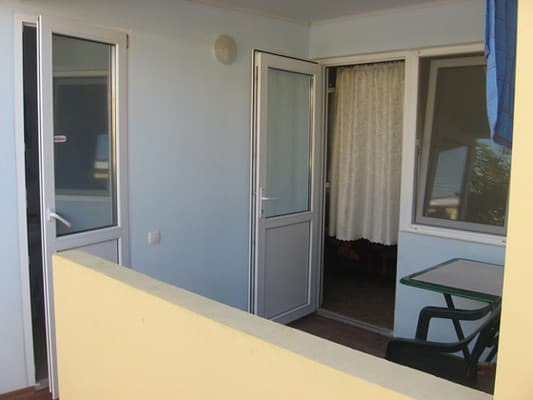 Tourists are offered 3-bed spacious rooms with a private entrance. Each room has a shady veranda, equipped with a dining area, overlooking the landscaped green patio. 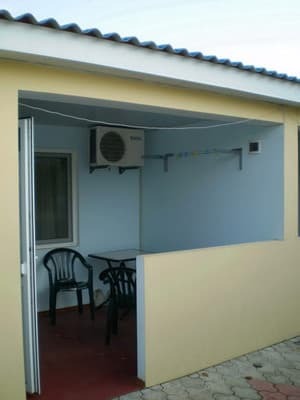 All rooms are equipped with a refrigerator, TV, gas cooker, air conditioning and mosquito nets on the windows. Dishes for cooking and eating are provided. On the territory of the hotel "Almaz" there is a grill, which is available for free. Also in the whole territory free wi-fi, free closed guarded parking lot, designed for accommodation of up to 6 cars. PRICES MAY CHANGE, YOU NEED TO RECEIVE INFORMATION FROM THE OPERATOR! Description of the room: Spacious cozy room with private entrance. Each room has a shady veranda, equipped with a dining area, overlooking the landscaped green patio. C / u in each room: shower, boiler, toilet, washbasin, mirror. 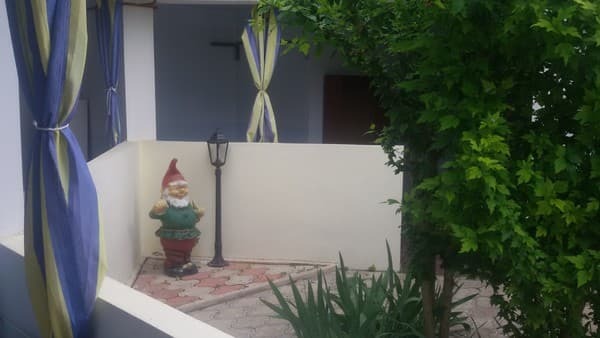 Entrance to the c / a from the veranda. 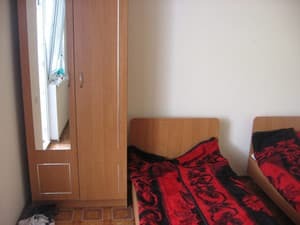 In the room there is a wardrobe for storing things with a large mirror, a bedside table, three beds. If necessary, it is possible to provide an extra bed in the room for free. 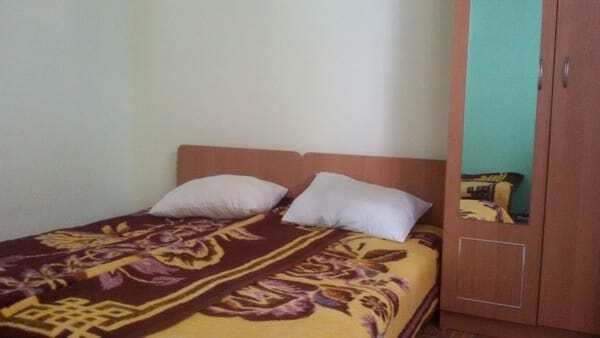 Mini Pension «Almaz» is located in the suburbs of Evpatoria in the urban settlement Zaozernoye (Peschanka district). From Evpatoria to Zaozerny it is possible to reach by a fixed-route taxi No. 8 or by taxi. There is a possibility to order a transfer - a meeting at the railway station, car station, at the airport (the transfer fee is 1000 rubles). For motorists GPS coordinates: N 45.1496610 E 33.2633400.